It’s amazing what you’ll find in the supermarkets around Ford’s Essex heartland. Reader Manuel Bezuidenhout certainly picked up a bargain when he spied the new Edge crossover out and about on lunchtime manoeuvres. This is the new, swisher SUV to slot above the Kuga in the Blue Oval’s expanding 4x4 line-up. The Edge is likely to reach well over £30,000 by the time it finally arrives on UK sale in winter 2015-16. This is One Ford in action. The Edge has been a staple in the US since 2006 and the company is now fast-tracking global models over regional derivatives. The process was started by former CEO Alan Mulally, who told CAR his mission was to stop the inefficiencies of having more than 100 models on sale globally - streamlining it to around 20-30 car lines around the world. Hence the Edge coming to Europe, following in the M&S tyre tracks of the baby Ecosport, another fast-track/short-cut SUV product to give Ford a competitor in the Nissan Juke space. 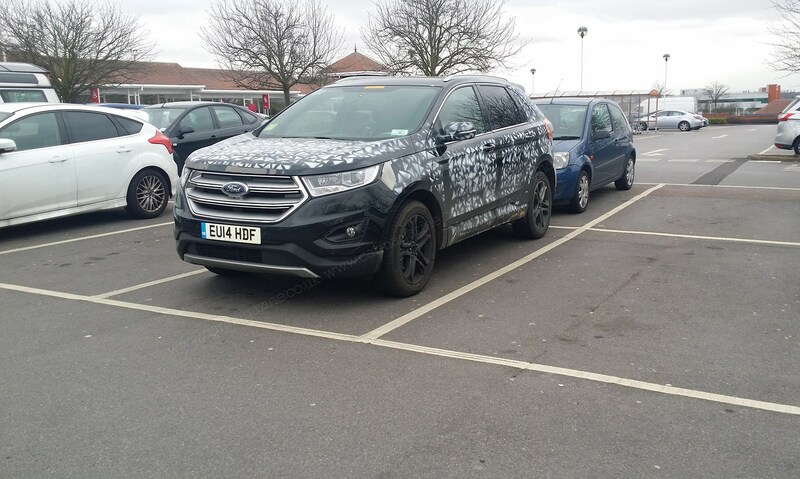 What’s the Edge doing in a supermarket car park? Despite the light camouflage, the crossover has already been unveiled (see our first official pictures story here). It’s hardly top-secret. ‘I live in Basildon, Essex and spotted this in the local supermarket car park,’ Manuel tells us. We guess engineers from nearby Dunton involved in final UK calibrations or staff from head office in Brentwood were popping out for a lunchtime sarnie.